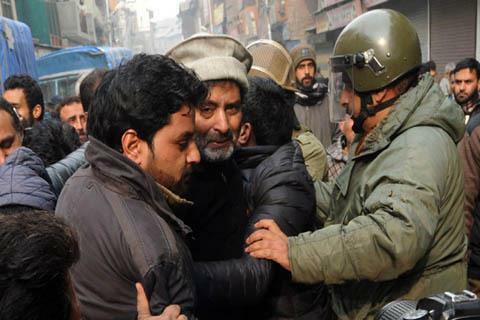 Srinagar, Feb 11: Police on Monday foiled march by separatist outfit Jammu and Kashmir Liberation Front (JKLF) on the 35th death anniversary of its founder Mohammad Maqbool Bhat who was hanged and later buried in Delhi’s Tihar jail on this day in 1984. Defying restriction scores of JKLF workers hit the streets at Maisuma and started march towards Budshah Chowk today. However, large number of security forces and police personnel deployed to strictly implement restrictions immediately swung into action and stop the marchers before they could hit the road. However, when the demonstrators, raising slogans, refused to disperse, police detained several of them. Similarly police also arrested about six activities of Muslim Khawateen Markaz (MKM) lead by Yasmeen Raja at Maisuma. All roads leading to Maisuma, stronghold of JKLF, have been closed with barbed wire to prevent people from entering or leaving the area. Authorities have imposed restrictions in Maisuma to maintain law and order.